The Prevalence and Significance of Sealing Accessory and Lateral canals. A Review of Literature. South African Dental Journal, Sep 2001 56(9): 419-424. It is clear from the literature that the prevalence of lateral and accessory canals are significant in number. Many root canal therapies are successful, however, without the clear obturation of main canals, or even the demonstration of accessory canals. The prognosis of these “successful” root treatments may be in question, as the currently, symptom-free tooth, may later flare up. Radiolucent lesions may exist with quiescent subacute periodontal reactions and subsequent bony alterations. Persistent periodontal pocketing may be attributed to these unfilled accessory canals. Failure of retrograde fillings from apicoectomy procedures could also now be linked to these unobturated and percolating canals. It may be argued that the percentage of failing root canal treatments due to unobturated accessory canals are small, but most dentists or specialists would prefer that these canals be obturated to improve the prognosis of teeth that are required for occlusion or as abutment for bridges. The possibility exists for their obturation when the main canals are cleaned, irrigated well and shaped correctly. The obturation methods, be it lateral or vertical condensation, both may provide for their obturation when executed correctly. Once the accessory or lateral canals are demonstrated, it provides satisfaction to the clinician, as the root canal has surely been obturated in all three dimensions and a successful root treatment is confirmed. It is my shared opinion that root treated teeth will not fail when these accessory canals havebeen demonstrated. Also, many frustrated clinicians are faced with failed root canal treatments, even when the root treatment appears complete on x-ray, but without demonstration of these accessory or lateral canals. Diagnosis and Treatment of a Developmental Defect Induced Alveolar Abscess: A Case Report. A thorough investigation was made to determine the diagnosis of a non-vital tooth. A developmental defect in the lateral wall of the central incisor made the tooth vulnerable to infection and consequently loss of its viability. CaOH was used to promote healing and apexigenesis and concurrently a calcific wall to close the defect. MTA was used to obturate and seal the canal with good long-term prognosis. Music, a Component of Preparation. The art of endodontics can be likened to music; it has components of structure, timing and expression, which are necessary to create a beauty of shape in harmony with form. Our performance is only appreciated when patient is comfortable. An encore is made by the chorus of applause of cusp on cusp, during mastication. Our masterpiece is not often appreciated by the world; so “silently” we get on with our work and produce our hidden legacy, the Root Treatment. A Clinical Study to Determine the Factors That May Influence Results in Non-Surgical Endodontic Retreatments. 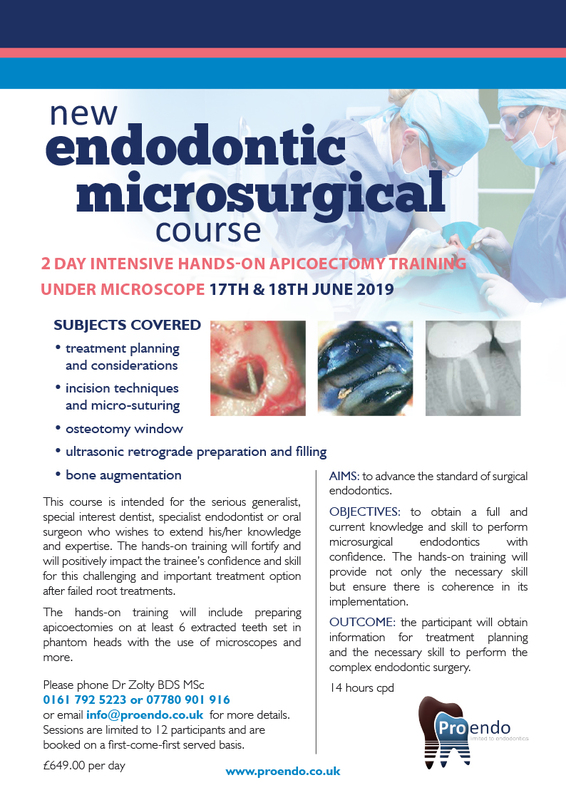 A two day intensive presentation and practical microsurgical endodontic (apicectomy) course in the UK. The places on the course will be limited. The practical procedures will be under taken with stereomicroscopes and state of the art equipment and materials. The delegates will practice the techniques on extracted teeth and develope the necessary skills to perform the procedures with confidence and backed up with the latest clincal and scientific research. Endodontics entails a full and complex knowledge of the root canal system, its embryology, physiology, histology and pathology. The education of endodontics includes recognising signs and symptoms of disease and the correct treatment protocol to restore health. Endodontic treatment includes the triad of root canal treatment, conservative retreatment and surgical intervention.